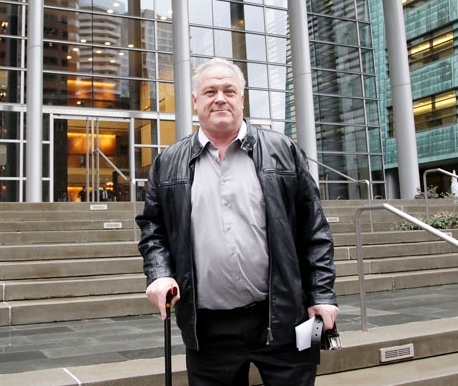 Team Canada skip Jim Armstrong appeared before US District Judge Ricardo Martinez in Seattle's US District Court at 2PM this afternoon to be sentenced for selling and dispensing counterfeit Viagra and Cialis drugs with the intent to mislead or defraud. Judge Martinez told Armstrong that as a retired dentist, “you are a trained medical professional... you knew better,” than to provide counterfeit drugs. He sentenced Jim to a $30,000 fine and a year of supervised release that must include 75 hours of community service. This was $20,000 less than had been recommended to the judge in the signed package plea agreement that avoided a trial. The fake pills were to have been distributed in Vancouver by his son Gregory, who also faced sentencing today. Gregory was sentenced to a year and a day in jail, a $5,000 fine and two years supervised release, and was taken into custody immediately. The judge will determine on April 12th whether the men owe restitution to the drug companies whose products were counterfeited. The Province published a report HERE. The Toronto Sun reported on background to the case last Sunday. Given that there were no surprises at today's hearing, it is not expected that Jim will be the subject of any CCA sanction beyond what Greg Stremlaw had previously announced: "disciplinary actions taken and specific conditions imposed; but that the athlete is still a part of the National Team program and will continue to train and compete as such at this time." Jim departs with the rest of Team Canada on Thursday to defend their World Championship in Prague February 21 - March 1. If the CCA does nothing then it will be regarded as an organization that does not live up to the standards it claims to profess. The athletes representing Canada are held to a high standard of ethics regardless of the sport they play on the international or national stage. Regardless of the caliber of player - if one commits a crime or breaks the rules of a signed athlete agreement, then that athlete must face consequences which includes removal from a national team. How disappointing that our sport organization doesn't have the strength to remove Jim Armstrong from team Canada. How embarrassing that our governing body feels it's completely fine to continue to support a person who has been convicted of a crime. There are a number of athletes in this country who could skip this team. They may not win a gold medal right away - but given time, funding and training that Jim Armstrong has received these past few years - that individual or group of individuals would perform very well internationally. And I would also say that it's a shame that Jim Armstrong doesn't take the higher road and resign from Team Canada. He has admitted his guilt, has been convicted and received his sentence. Now it's time for him to move on. What a shame that on top of now being convicted of a federal offense, I watched Mr. Armstrong walk out of the local liquor store a few days ago without the use of any walking aid. What were the circumstances that allowed Mr. Armstrong to be deemed a wheelchair curler. it is all a conspiracy...remember? Jim Armstrong has come into this program under a black cloud. He was an able bodied curler who now walks with a cane. He FAILED being qualified once, learned the system only to pass the qualification on his second try. Yes, he knows the game, but if the CCA would open their eyes maybe they could see that other non questionable players across Canada could also skip the team. Now with his arrest the black cloud has only grown bigger. As earler stated he has admitted his guilt, has been convicted and now has received his sentence. A fine that could be paid for with the carding money he has received from being on team Canada and still have some left over. Not even touching his profits from his counterfeit drug deals. The CCA seems to thing all this is alright. Now they too stand with Jim Armstrong under this Black cloud. I am a wheelchair curler who is fed up trying to explain to all the curlers at my club the CCA decision to back Jim at all cost to all other wheelchair curlers. Jim has been an embarrassment to us wheelchair curlers and now to us Canadian's. It's time the CCA to do the right thing and have Jim Armstrong removed under the code of ethics for his violations. It's also time for Jim to man up and resign from the program. Removing the black cloud from us honest wheelchair curlers. Maybe we should wait to hear what the entire story is. Remember, Jim assured even you, Eric, that there was more story than told to date. AND, perhaps the fine instituted says something, since it is about HALF of the request from prosecution, AND, he had the same charges as Greg, with the US's own guidelines calling for a one year minumum in prison as the ABSOLUTE low end of sentencing.........I doubt the story is anywhere NEAR over. It is a shame that our country is represented by a man who has admitted to his guilt of criminal activity. The CCA should step up and live by the honor by which the Canadian atheletes are expected to live. Mr Armstrong does not deserve the honor of representing our country in Prague when there are so many more deserving curlers. Shame on the Judge, Jim Armstrong and Team Canada. The fact that the fine is less than originally expected is not the point! The point is that he committed a crime!!! Plain and simple - there may be more to the story but that doesn't matter. He was caught bringing counterfeit drugs across the border from the US into Canada - he knew he was doing something wrong. There are no ifs, ands or buts about that fact. To say there is more to this story does not negate the fact that he has broken the law and has not lived up to his signed player agreement that says he is required to live up to a high standard of ethics and a representative of Canada and wheelchair curling. Give your heads a shake. He is lucky he didn't get jail time! Not only that - he was caught with counterfeit drugs that are sold by Pfizer Canada (Viagra) a major sponsor of the Canadian Paralympic Committee - how brutal is that! So let's continue to turn our heads and ignore all those facts because he happens to be a good ol' boy who used to curl with those who make all the decisions at the CCA. Those who, it seems to me, are too frightened to step up and do the right thing. Take a breath, people, and at least let him get back to Canada to respond. Jim has always maintained their is another side to this, and let's at least get him home to find out. Kinda Ironic Jim took it STANDING UP! The CCA banned an able body athlete from competition for at least two years who tested positive via a random test at the Edmonton Brier. The athlete was not convicted in a court of law for any infraction. The CCA took the appropriate action in that case. But as far as the Jim Armstrong situation is concerned, the CCA's lack of action has cast a very black mark on the sport, and has made us look like fools in the eyes of the international wheelchair curling community. Hopefully, the World Curling Federation will have the where with all to take appropriate action in Prague even if the CCA doesn't have the stones to do so---and I don't mean curling stones! I would think Jim is a little busy dealing with Greg issues at this moment. Let's give his opportunity to give his side, if there is one. What seemed to have happened in Seattle, (other than a lesser fine) has come to no surprise, yet Jim has always maintained there is another story....where is it? Well, I guess if anyone was that annoyed with the CCA they could boycott the Nationals in Edmonton. The most relevent question is can he perform with this distraction? His Mother, his Son, himself, as well as in the air in 48 hours. As to those who believe in Jim, give your head a shake. As for hearing from Jim, for the other side of the story, you will never get the truth out of him. What he will tell you is that he was the "victim" in all of this. The real victims were the people who purchased these fake drugs and the question is, "what affect did these drugs have on them?" And as for his son, Jim sold his son to the authorities in order to save himself. Tell me, what father would do that? Most parents would protect their children, not Jim. In simple words, Jim has gone from "fame" to "shame" or "hero" to "zero". As like others, I am totally embarassed by the actions of the CCA and no where have they stated what actions they took in respect to Jim. A complete coverup. I guess, it goes by the old saying, "it's not what you know but who you know". Seems you are providing a pretty serious allegation. Who is covering up? Jim? Greg? CCA? US Government? Seems there are many facets to this. Jim has maintained from day 1 there was another story, and I am prepared to wait another day to hear his. If nothing new by tomorrow, then I guess there wasn't much to say. As someone stated earlier, the CCA is NOT shy on suspension for drug abuse, yet somehow has been reluctant to smack Jim. It appears they DO KNOW something more, since logic suggests it is easier to wash your hands of a headache, than nurture it. Tomorrow, or Jim is total BS. Sorry, yet anoher question (but, unfortunately, no answer), has anyone talked to any of Team Canada? One would think they are likely more in the know....or have they been silenced by the beaurocrats? I am a fan of Mr. Armstrong for what he has accomplished but I do not put him on the untouchable list. There is no other side to a story that consists of being an enabler to your own sons illegal activity. I hope when he looks at the man in the mirror he sees what I see.........and he will live with that for the rest of his life. I, too, am a long time Armstrong fan, but the silence is deafening. He promised us his side when all was said and done, and where is it? If I was a Team Canada wheelchair curler I would not play alongside him. He is making a mockery of wheelchair curling, his son took the rap and in reality the fine covered by what he 'made'. If you played for another Country you'd be 'off programme'. Where is the comment I sent a few minutes ago? Clowns like these should at least have some of the facts. AND, Eric,IF Jim does not respond, or, as he indicated is tight scheduled, I would strongly suggest tha you put my posting as a completely separate entity that won't be missed by any of your readers. It is a shame that Armstrong has the opportunity to represent Canada once again. Let it be known however, that Canada is not the only country in which they disregard personal behaivor or turn a blinds eye on qualifying individuals as wheelchair curlers when, indeed, they do not qualify. Ever since eligibility issues became a topic of public discussion, there have been mutterings about athletes from other countries curling while ineligible. I have never conme across a specific allegation, however. Perhaps the person making the accusation could supply a name, or a country? It should be noted that while WCF rules clearly stated that eligibility rested on a need for a wheelchair for daily mobility up to and including the Paralympics, that requirement was subsequently changed to "severe impediment of lower limbs or gait." You are no longer required by WCF rules to use a wheelchair off the ice.